Chinua Achebe remains one of the best writers the world can boast of. All his life, he showed undying passion for the development of Nigeria and Africa. In his novels, he wrote against the ills that have befallen Nigeria. He saw well. He saw the decay well. He saw the nonsense well. Achebe saw the gross selfishness well. And from a patriotic standpoint, on 5th September, 2000, he published The Trouble with Nigeria. In the book, in the first page, first paragraph, first line, Achebe said: “The trouble with Nigeria is simply and squarely a failure of leadership. There is nothing basically wrong with the Nigerian character.” This is not correct. 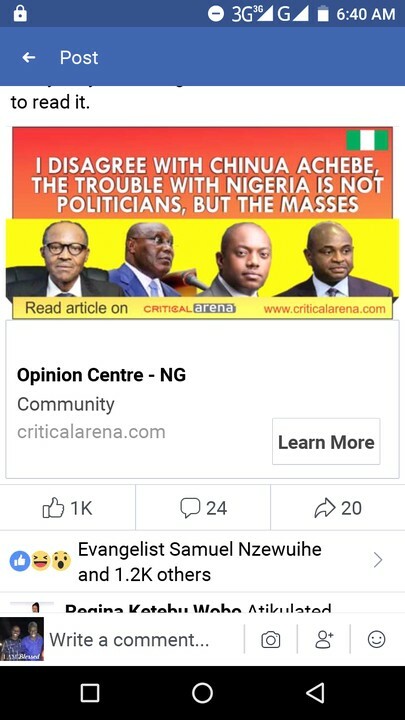 I disagree with Achebe in this one. The trouble with Nigeria is not politicians or bad leadership; it is the people of Nigeria, the masses. There are lots of things wrong with the present Nigerian character. 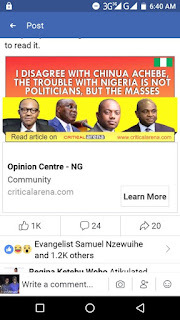 Achebe is right that we have been having politicians who are after themselves and political party, not the nation. But this is same with the masses, the Nigerian people. Since democracy is a government of the people, by the people and for the people, if anything goes wrong in a democratic setting as a result of unpatriotic acts, the people are responsible for it. Nigeria is in bad shape today because she lacks patriotic citizens. It is unfortunate that when the word patriotism is mentioned, people point to politicians who are boldly doing business with Nigeria’s resources because the masses are oblivious of the politicians’ tendencies (so I believe). When patriotism is mentioned, we should point to ourselves and reminisce how we have shown our love for Nigeria and willingness to defend her. Who loves Nigeria and has proven it? Who? We blame politicians for votes buying. Who are selling votes to them? The masses! The politicians are the people in need of the commodity (votes) in bulk; the people are the producers of the votes and the so called influential persons are the suppliers of both the money and votes. The influential persons are the godfathers. They tell the masses whom to vote and then dole them some change or buy them some bags of rice and salt. This is how politicians buy their way into the national treasury. The politicians with the biggest amount of money to throw around, become more popular and even the elites join their train once settled or consulted. This has become a sort of the only acceptable beat in the Nigerian political arena. Only minority are interested in the candidature of the aspirants and their likelihood to effectively and efficiently drive Nigeria off the storms threatening her. Well-meaning people who have no money to throw around hardly get up to two per cent of the electorates’ supports and votes. Who do we blame in this kind of situation? The politicians? That would be so very unfair! Injustice! How can we blame a man for paying for and obtaining a product the producer has placed for sale? How can we have our cake and eat it? The votes suppliers protect their heavy-paying customers. Which supplier of a commodity would joke with customers who buy goods in bulk and pay in advance? After the 2011 elections in Imo State, I eavesdropped on two young men discussing how an angry politician who had lost in polling units in Ngor Okpala, Imo State, sent some thugs and they went for the head of a chief in Ngor Okpala. The chief was given huge money to buy good votes but he failed supplying the badly needed commodity. I overheard one of the men in the discussion say to the other that the chief really shared the money, but the people took the money and voted against the candidate who had given the money. The thugs who visited the village in a very flashy car were suspected and queried by some unarmed youths, they brought out their AK47s and began shooting sporadically. They sacked the villagers, hacked down three people including a twelve-year-old boy. The one of 2007 is still fresh in my memory. It was the day I went to cast my first vote. I went to the polling unit and saw some men with huge cash at the polling unit sharing N500 to anyone who agreed to vote for their party men. Another group came with N700 and the electorates changed direction. I saw young and old people willing to cast their votes for who was going to pay more money. Any political office aspirant who did not consult the votes suppliers risks losing woefully because the masses vote based on what they have been told by the votes suppliers, not what they can see about the aspirants. No, not based on facts and records. No! Not based on credibility and competence! Many electorates cast their votes for the candidates they have emotions for or whom they believe hail from their tribe. Many others vote the politicians who make more promises to them. So the troubles continue. Politicians see it as a game. And they play along. A political group goes to the West and promises them presidency next four years (because the votes are readily available for purchase, they can buy it from the electorates with eyes closed) and the West welcome the idea. Another group goes to the South and promises them presidency the next election year and the South rally round the group. This happens in the North and East. Each zone is asking, “What is in it for me?” Go to the state level, and the promises keep raining from the politicians. Break it down to the electorates and they ask you same question, “What is in it for me?” The votes suppliers give them some change and they sell their votes. This is how the masses have kept Nigeria down for decades. The masses introduced the game the politicians are playing. This is how politics in Nigeria has become a game. This is how the masses play games with their lives, economy and well-being. This is how the masses are the trouble with Nigeria! And when a team is desperate to win a game, foul plays become the order of the day, deadly tackles, false alarms and diving into the goal area at the slightest tackle—just to get some pity and win the game. Everything is game. Game? Game! Shaping Nigeria is in the hands of the people, not politicians. Getting great leaders run the affairs of the nation is in the hands of the people and it can only be possible when everyone puts Nigeria first, when everyone sees Nigeria as their own country, when everyone understands that when troubles come, the money in their hands cannot save them, when everyone understands that when war happens, nobody goes to the market to trade, when people understand that when a neighbour is killed, they could be next to be killed. I remember a story my grandmother told me many years ago. She said it happened in Amala, Ngor Okpala LGA, Imo State. She said a woman and her son were frying garri under a tree by the entrance of their compound. It was on an Ekeukwu Amala Market Day and many people had gone to the market. The woman and her son heard a woman crying for help. It was a neighbour of theirs. This neighbour of theirs had a son in his twenties who had some mental disturbance. His case got worse that day and he picked a machete and began to cut his mother. The woman’s son raised his voice to shout, but the mother told him to keep quiet and continue frying the garri. It was learnt later that she was not in good terms with the woman crying for help. After a minute, the woman’s voice was no longer heard. Her son had butchered her to death and went back into the house. About three minutes later, the son of the woman screamed and ran outside crying for help. The mad man had caught up with the mother and began to butcher her with the same cutlass he had used on his mother. The youths rapidly responded to the cry and overpowered the mad man. But before they arrived, the woman was already in parts. She died. Those within the territories of Nigeria, who keep mute at ills, injustice and unfair treats meted out to anyone in Nigeria, is wittingly or unwittingly establishing grounds for such to happen to them. The power of the people lies in their one voice and one purpose. Patriotism is when the interest of the nation, the state, comes before personal interests. Nigeria is like a company owned by all Nigerians and the political office holders are the managers. If the owners of the company employ managers who cannot run the company well and things go wrong, the employers should be blamed, not the managers. The time of sentiments and risky loyalties should be over. If anyone has the interest of Nigeria at heart, that person should sit down, examine all the candidates for the political offices, check their pedigree and history and then cast their votes based on their convictions. Even if someone’s vote was the only vote that a candidate got, there is no issue with that—so long as it was cast based on personal convictions, not sentiments or some personal aggrandizements. That is patriotism. Only patriotic Nigerians should be voted into office. Vying for a political office just for the pleasure that comes with the office is not patriotism, it is madness birthed by wickedness against the nation and it is only the electorates that can stop this madness and kill the wickedness. Patriotism is when your father comes out for a political office and another candidate whom you believe is more knowledgeable in that area, than your father is, comes for that office, you go to the poll, cast your vote for the other candidate—in the interest of Nigeria, your dear country. Patriotism is speaking up when a political office holder underperforms or does things unlawfully. Unpatriotism is defending a political office holder who has obviously underperformed because you are a beneficiary of the politician’s government. If any individual ever campaigns and/or votes for a politician he/she cannot allow to manage his/her personal business for him/her, that individual is a hypocrite, an unpatriotic Nigerian. This is no longer the time to leave Nigeria for the alleged owners. This is no longer the time to take up arms, kill and get killed. This is no longer the time to pretend you have no role to play. This is no longer the time to watch like some audience in a live concert, all the drama that have been rolling out from the politicians. Democracy is not a show of the politicians, by the politicians and for the politicians. All the countries we desire to go and live in were made better than ours by the citizens of that country. They made use of their heads and put national interest first—because that determines what happens to everyone within the geographical space. This is no longer the time to sell your conscience to your party, get some appointment or cash and hide everyday due to insecurity or have friends of yours and loved ones killed. This is no longer the time to listen to big big talks. This is the time to list all the candidates and begin to evaluate them yourself. Score them and vote the one that has the highest score. When the electorates refuse to be bought over, politicians would focus on developing themselves and the nation, not consulting godfathers.